This entry was posted in Civil Rights - Wellness - Politics, History - Religion - Education, Social Lifestyles and tagged Border security, Capitalism, Corruption, Immigration, Inequality, Labor Exploitation, Labor laws, Scapegoat contracting, U.S. labor by Professor Taboo. Bookmark the permalink. What is particularly interesting to me is why the same common yet illegal practices that go on between the US and its southern neighbours does not go on north of the US with Canada. This raises the question of why. Any ideas? Tildeb, that is a very interesting question! That might be an investigation for a Canadian. I’d be very interested in understanding those whys and why nots. Do you have any ideas yourself? 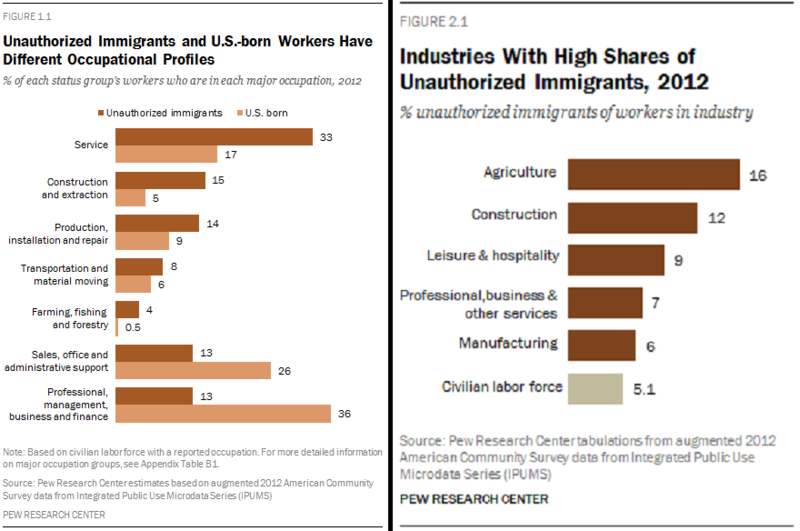 As long as those exploitative jobs still provide the illegal immigrants a better standard of living than what they can get in their own country, they would continue to keep on coming. Trump’s wall would be a long worthless collection of bricks if the practices of these American businesses are not put in check first. And we wonder why there’s never ever any serious effort for immigration reform. Both parties benefit from the abuse of illegal immigrant labor. BINGO Rosaliene! I would sure like to know ALL of the details in those two cases I cited above with Target and H.E.B. that were settled out of court. But then again, I do know exactly why those two mega-corporations would want those files permanently sealed, even destroyed. Duh, right? And how many Americans remember the early 20th century American “interventions” and business exploitations in Central and South America and their long-term impacts? Pffffttttt, how many American’s even know that many of our nation’s landmark monuments, buildings, the Capital building, White House, etc, were erected by slaves and immigrants? Amazing how that elephant in the room or the 500 lbs guerrilla NEVER get brought up in a modern discussion/debate. I guess some Americans HATE looking in the mirror. Re: your comment about who erected the government buildings — I wish this information could be made into a news article and printed in one (or more) of the popular conservative newspapers … or better yet, presented in a discussion on Faux News. The holy whites need to be made aware of this. I’m not ignorant to their response … but I still say it’s a FACT that they should know about! Thanks for this great series, Professor. Your arguments pop balloons en masse, and in a most satisfying, resounding and edifying way — as only genuine truth can. Wowsers! Thank you Bill for such a kind, flattering comment. That is humbly appreciated. My assessment has, as usual, been more critical. Hahaha. I still think I could’ve done better, on both Parts. GULLIBLE and IMPATIENT riled up brains and hearts! 😛 What I’ve done here anybody can do themselves or with a little assistance from a librarian at your local county or municipal library… or the Library of Congress. HAH! The proudly gullible would rather burn the books and torch the library than have their law-and-order minds confused by a librarian. Unless they find a libertarian librarian (never a “democrat party” librarian) who voted for Trump, has memorized his 100 words and watches Fox in the Hen House News.